This article was published by Gary Slater (@AudiMan2011) on January 14th, 2019 in the Forza Horizon 4 category. StealthVel, adam thompson, jwesson1 and 5 others like this. The GTO is the one I can't wait to drive the most. sangdude82, LaSupra, ferhound and 7 others like this. It also wasn't too terrible in FM7 as well. Nielsen and Nogoodname like this. LaSupra, boabmatic, Morbid65 and 4 others like this. Glad they were able to get them back. Now the Modern and Retro Rally events won’t be full of just Subarus. sangdude82, turbofozz, raven214 and 4 others like this. Yeah, the Modern Rally division was fairly terrible for that. raven214, Cloudy and L8 Apex like this. I didn't realize how much I loved having Mitsubishi around until they were gone. It's really stuff like that that will get me because the brand has been in the game so long. You don't miss your water 'til your well runs dry. I've always had a fondness for Mitsis. Very glad to see them back, especially the GTO. Legit just needs the FTO, Starion and Evo 3 to be perfect. Still, fantastic news that they're back. curtis 1-8-7, boabmatic, Morbid65 and 2 others like this. Why are you thanking us? GTO and Galant for sure. They should bring the FTO one of these days too. I wonder what happened? 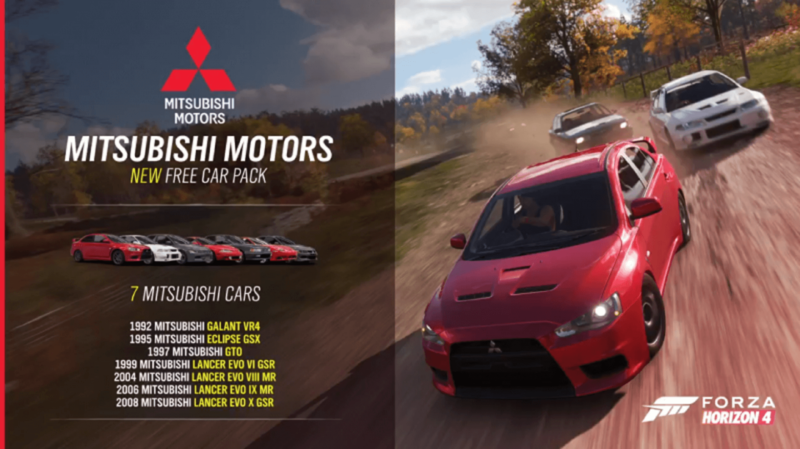 Same cars as in FM7. I bet they even have the same bugs, like the GTO's speedo. I don't know why some people are so down on that car pack. A few of the cars in that pack look awesome - especially that Shelby King Cobra. Less interested in the custom hot rods, but it's exceedingly rare that I care about more than 2-3 cars in any car pack anyway. Hard to please 100% of the people 100% of the time. Now if only they could convince Toyota to come back. sangdude82 and XRaider like this. May I ask if the GTO is the version with pop-up headlights? Forza series GTO is not a pop-up light model. Time to remake my old 1000hp sleeper from horizon 3. Emerald green/Beige two tone, purple 90s tinted windows, child honor student decal, jesus fish decal and a obama bumper sticker....always rode around in 6th gear so no one could hear the LS swap,,and kept muffled exhaust, that car was a SLEEPER. Shocked the hell out of alot of unsuspecting people. L8 Apex, GranTurismo guy, ImaRobot and 2 others like this. My Evo VI dreams have returned. GranTurismo guy and INEEDNAWZZZ like this. It usually arrives in 7-8 eight hours from now. ImaRobot and LaSupra like this.